A fleet of tall ships is set to sail into Philadelphia’s harbor on Thursday, May 24 for five days of waterfront fun, ship tours and sailing excursions at the 2018 Sail Philadelphia Festival. 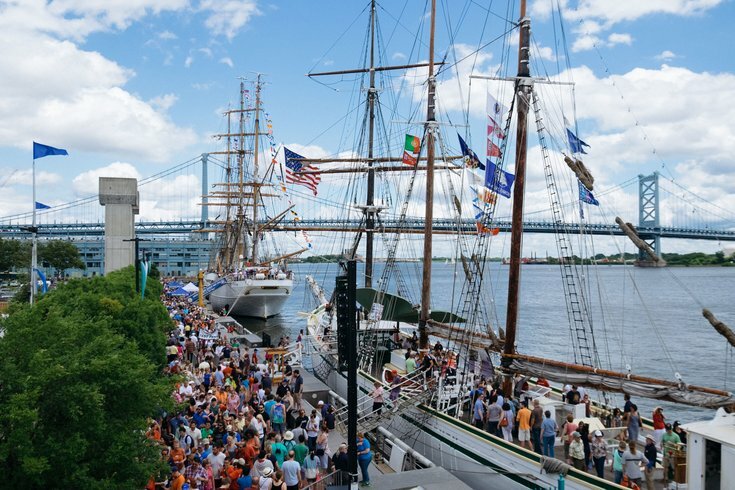 From international military ships to teaching crafts from U.S. ports, festival-goers will have the opportunity to explore nearly a dozen vessels, learn about life on the water and enjoy family-friendly entertainment along the waterfront at Penn’s Landing. Get a first-hand look at seafaring life on the largest tall ships at the festival. Crew members will be aboard to answer questions and show you around. Ship Tour tickets are timed, so plot your route in advance using the festival map. Early Entry tickets will get you on Ship Tours between 11 a.m. and noon (for one day) before general boarding. After that, you’ll have unlimited non-timed entry on touring ships for the rest of your purchase day. This is the best value of the festival. Bucket list alert! Enjoy an unforgettable 120-minute Twilight Sail (or enjoy a 90-minute Day Sail) with a glass of wine in hand. Parade of Sail Cruises are already sold out, so Day and Twilight Sails are your only chance to get out on the water. You’ll find hands-on educational activities, maritime-themed movie screenings and more at the Independence Seaport Museum. Admission to the museum is included in all Sail Philadelphia tickets! Head to Deck at Independence Seaport Museum, Admiral’s Tavern on the Cruiser Olympia, and the Sail Philadelphia Beer Garden at the Great Plaza at Penn’s Landing for local craft beer and seasonal cocktails. Kick off the summer season with a spectacular fireworks show at Spruce Street Harbor Park or Blue Cross RiverRink Summerfest on Saturday, May 26th at 9 p.m.
Get tickets in advance and create your own sailing adventure at sailphiladelphia.org. Friday, May 25 – Monday, May 28, 11 a.m. – 7 p.m.
Friday, May 25 – Monday, May 28, 12-7 p.m.